If you’re new to Young Living, and why I love it, let me fill you in. Every month Young Living Essential Oils gives me amazing products for FREE when I order a certain PV (personal volume) amount. These freebies come automatically with my order. And they aren’t chump change. They aren’t sample sizes, or product that doesn’t move well. They aren’t blue-plate specials, which, honestly, means the chef is trying to cook what’s about to go bad. The products I get and have gotten through monthly promos are popular products and Young Living’s way to saying thanks for being a great customer. 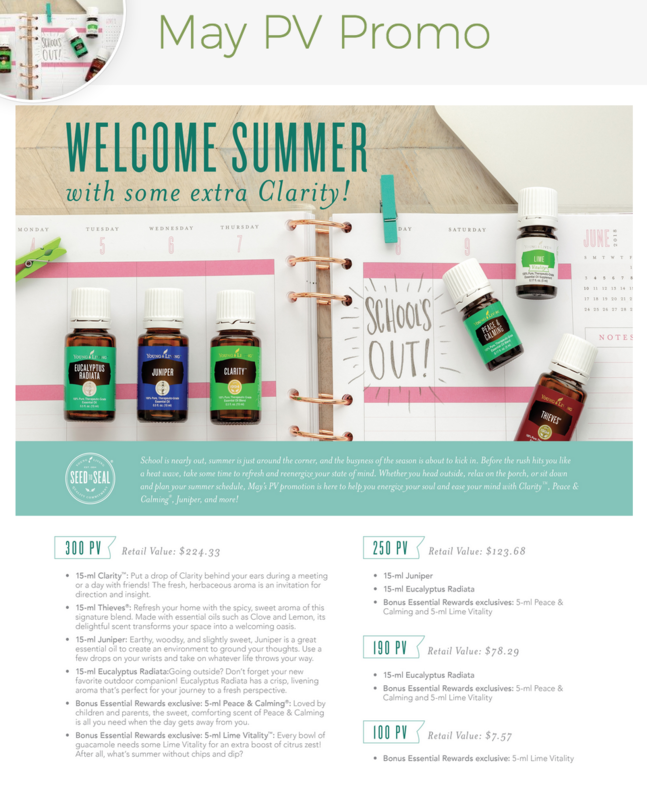 Some of the promo products are marked *ER Exclusive, which means they are promos only for Essential Rewards orders—and if you’re ordering Young Living products but NOT on Essential Rewards, you are missing out. With ER, there are no commitments—customize your subscription box every month, all month long until midnight of the day before your box is scheduled to ship. You may even find that a product you order every month on ER is a promo product, so it gives you an opportunity to try something different and still get your regular product but for free. Plus, you earn points back to use on whatever you want. I recently used over 140 points to get a bunch of products I’ve been wanting to order but didn’t have budget for. Personally, this is a must have for me year round. Why? Because I like to breathe! I apply it topically in the morning and tend to diffuse it at night. Friends of mine add a few drops to cotton balls and place in their shower to awaken sinuses. This is also the eucalyptus that smells the most spa like, so it’s a wonderful oil to use for relaxation. The name literally says it all. I can’t wait to get my bottle because it will be my first time with this blend. You can wear it on your body, diffuser jewelry, or diffuse it throughout a room. It’s a fan favorite for sleep and relaxation, so I’ll be diffusing it in Mom’s room at night. I have to say, I’m intrigued to get juniper essential oil because I know for a fact that I am allergic to juniper bushes (pruning one in my yard nearly suffocated me!) That being said, I love gin, and juniper basically defines gin! So, let’s see what happens.